The first fairground we have record of was the Exposition Grounds which included several buildings and a quarter mile race track. In 1930 the grounds were put up for sale. The Webster County Farm Bureau, which sponsored the Extension Service and 4-H until Federal law split them in 1954, decided not to buy the land. It was sold partially as housing units, commerical property and for a city park and swimming pool. The Webster County Fair sputtered for several years. One location the 4-H Achievement Show was held at was the Enos Airport for a few years. 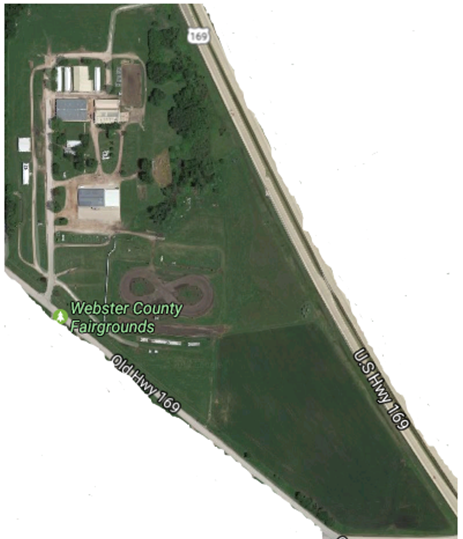 In 1946 the Fort Dodge Betterment Foundation donated 11.5 acres to be used to build a fairgrounds for Webster County. 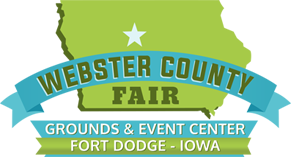 Funds were collected and donated labor and materials made it possible to have the first county fair at the west end of Fort Dodge in 1949. The auditorium was also built by volunteers and was completed in 1951. In 1970 the Fort Dodge Junior College which became Iowa Central Community College made an offer to buy the grounds to enlarge their campus. While the Etension Service didn't want to sell, they felt the need to not stand in the way of ICCC building projects, so they agreed to sell if the college would pay enough replacement cost and allow the grounds to be used for three years while new grounds were located and made ready to hold a fair. The 40 acres 2.5 miles south of RJ 20 & 169 were purchased from Alice Brodsack in 1971. In 1972 the Auditorium and Show Barn were built and the first fair was held at the present grounds in 1973. Five of the orginal pole barns where moved to the new site, and three of those remain today. This took several trips because each barn was cut in two to transport on teh low-boy truck. Because of the underpass on highway 169, they were routed through Moorland. Many addittions have been made to the grounds since then. In 1973 the outdoor arean and commerical building now known as the exhibit building were completed. The hourse bard was built in 1979 with 60 box stalls. 1981 saw the addition of electrical hookups for the camp site. In 1981 we replaced the shingle roof on the first pole barn with a metal roof. We replaced one roof each year in 81, 82 & 83. These roof replacements were financed by Federal Revenue Sharing. A on-site caretaker moved on to the ground fo rthe first time in 1981 and lived in a mobile home which was later bought from him. The next large addittion was a beef barn build in 1984. This large barn replaced two pole barns and enclosed the livestock scale and scale house. The wash rack was completed at the same time. In 1987 the track for pulling and racing events was built. 2016 saw an new park shelter donated by Farm Bureau and the addittion of 12 more camp site hooks up in the norhwest corner of the property. So far in 2017 we have repaired the asphalt on the main road, started consutruction on a new archery range for the 4-H kids, along with several minor repairs to various areas. Check out our PROJECTS page to see more.